Minutemen. All 153 songs. Least Best To #1 Hit Song. I can say with absolute certainty, the Minutemen are in the top five in my list of all-time favorite bands. It’s an always fluctuating list, and at any one minute, they can be number one, along with such notable artists as the Beach Boys, Devo, the Clash, Black Flag, Queen, KISS, the Velvet Underground and wow… look at that, off the top of my head I reeled off seven other bands and didn’t even include the Beatles or Wings or James Brown or the Cramps. Or Fugazi. Funkadelic. The Ramones. Jeez, what kind of list is this?? Do you understand me? I love the Minutemen. The Minutemen are that great. The Minutemen literally changed my life. I saw them play in 1985 (club 688 in Atlanta) during the gestation stage of my punk-rockerdom. I had dyed my hair jet black and wore boots and had the right t-shirts. But I was a total poseur. I didn’t know what punk rock really was until I saw D. Boon and Mike Watt and George Hurley. Seeing the Minutemen that night taught me what “punk” rock really could be. What it really was. What it is. 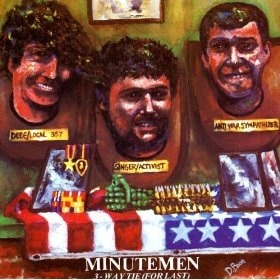 The Minutemen; three dudes from San Pedro. Three dudes blasting out a concise, idiosyncratic mix of jazzy, funky, rock, equally as inspired by CCR and Steely Dan as by Gang Of Four and The Urinals, on the same plane as Queen? KISS? The Beatles? Hell, yes. They grew out of – were a part of – and were influenced by the punk rock scene, but to simply call them and the music they recorded “punk” doesn’t really do it or them justice. It doesn’t describe an accurate picture. But how to describe the Minutemen? To quote Louis Armstrong, ““If you have to ask what jazz is, you’ll never know.” And this is kind of how it is with the Minutemen. Sure, you can listen. But until you’ve lived with it for a while. Really let it sink in to your bones, you’re probably not going to know. So I hope you’ll do that. I hope one day you can listen to “Toadies” and it can really make you feel something. To facilitate my research I am going to post a random song on a somewhat regular basis. And then compile the list as I go. I couldn’t possibly do it justice if I made the list first… sure, I have a pretty clear idea what will end up at the top and a few clunkers to place near the bottom. But the 133 or so songs in the middle? I need to give ‘em another thorough listen. A few notes: I’m going to include the cover songs. The Minutemen did a lot of covers and these tunes not only tell a story in regards to who the Minutemen were influenced by, but tell a story in the way they interpreted the song. Made it there own. Their distillation of Van Halen’s “Ain’t Talkin’ ‘Bout Love” is almost the epitome of the Minutemen. The Minutemen released about 153 different songs, (180+ total including live versions and remakes), spread across 4 studio lps, 6 eps/singles, a compilation lp, a live lp, and on assorted various artist compilations. (A quick shout out to corndogs.org, a great resource for all things minutemen and who helped me with the odds + sods). For the instances where they re-recorded the same song or put out a live version, I will post all of them together. For example, “I Felt Like A Gringo” has three versions; the studio version from Buzz Or Howl Under Influence Of Heat, a live version from Ballot Result, and an alt-studio version from the BEST OF RAT PEOPLE compilation. There will be more details and insights and anecdotes as we proceed. In the meantime, I recommend you watch the excellent documentary WE JAM ECONO and read OUR BAND COULD BE YOUR LIFE. To kick off this project, the namesake of our sister blog and my personal rallying cry, “Party With Me Punker“. Recorded in 1983 and clocking in at :54. This tune will most certainly be in the top 10. I could be wrong, though. Party With Me Punker! I think it goes without saying this will be number 7 on this chump list. From the final recording, 3-Way Tie (For Last) is perhaps one of the few songs I kind of actually dislike. It starts off as a disjointed instrumental dirge – like something BLACK FLAG would have put out. You know, those free-jazz instrumental “jams” from THE PROCESS OF WEEDING OUT? But then… out of no where it becomes this short little rocker. I like the song at the end, but the lead-in, oof. But it’s par for 3-Way Tie (For Last), an odd mix of slow long covers, noodlely instrumentals, spoken word pieces and some solid tuneage. When I started this list, I wasn’t sure where it would lead. I was fairly certain “Spoken Word Piece” would end up at 153. Now I’m not so sure! NOTE – this song popped up in my shuffle and I formulated my review on first listen. In digging a little deeper I re-realized it’s Joe Baiza playing guitar on this track. For now, no tie for last, this is 153.